Disclaimer: As a product reviewer for Commute By Bike, I am providing my unbiased opinion of any products provided to us by any company. I do not posses any type of relationship with the product&apos;s company or parent companies. Companies that send in their goods to be reviewed do not compensate me in any way. My background: I am 5’7?, 190 lbs. I am a hungry man and I like to eat good food especially while I’m riding my bike. I am bike commuter that travels 34 miles round trip. Testing Grounds: My belly, riding to work, riding on the Fullerton Loop and when I am hungry. * Non-dairy chocolate chips contain organic cane sugar, organic cocoa paste, organic cocoa butter, non-gmo lecithin and organic extract of vanilla. Similar Products Tested: Just about every bar out there imaginable. From Balance Bars, Power Bars, Cliff, Snickers, Payday, KitKats, Atkins, Pria, and many others. Good: What I loved about BumbleBars are the fact that you don’t get that annoying sugar rush and the dreadful sugar crash like you do with other bars. I like the fact its organic, non-dairy that means less or no gas for our lactose intolerant friends. For the size of the bar, you only get 200 calories. The biggest factor bars would be its taste. How can I say this without waking up the neighbors…IT TASTE GREAT! 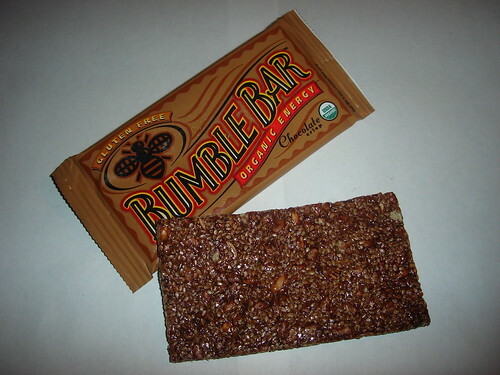 BumbleBars are SO AWESOME! YOU AS A READER AND A CYCLIST NEED AND I MEAN HAVE TO TRY IT! 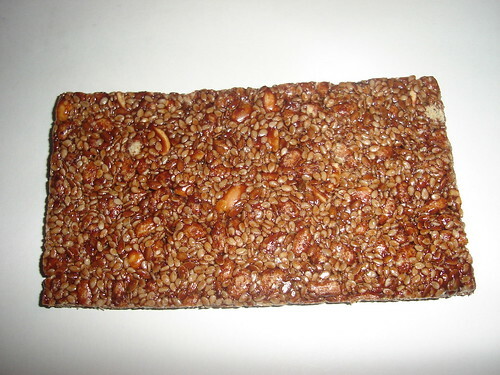 Bad: As great as this bar is, the only thing bad about it is that you get seeds stuck between your teeth, but that’s it! Nothing is wrong with this bar. It tastes great, it doesn’t melt. Summary: BumbleBars are great. They taste good, the people at the company are nice, it simply is an awesome bar! I have to vouch for these bars. They are amazing…as a vegetarian I am very concerned about what I put in my body and what my kids put in thier body. But we these bars no worries….and they taste soooo good!!! A much better alternative to those other energy bars. My only qualm…I just wish they were more accessible. We ran out and I want more..hope they will be carried in my local health food/grocery store soon. You may order BumbleBars direct from our website. We have some great specials and we feature a flavor of the month that is always discounted. I really dig these bars too. They are easy to swallow, they are tasty and like RL said, they don’t give you a sugar crash. I like these bars too. Not too sweet, I liked the light crunch and chewiness. I’m glad we were able to try some at the CBB picnic. The only bad experience my son James went through was chipping his filling while eating the bar. But he still kept eating it. Dave has packed some for his military training this weekend. The great thing about it is that it packs well and will not melt. Mmm, they look good. Is the only place to buy on the website?